In September 2017, Rota in southern Spain hosted the central events of the centennial of the Aviación Naval. The centenary was commemorated with a military ceremony at its home base of Base Naval de Rota on September 15, and on the following day with an international aerial and naval exhibition at the Rota beach front. The Aviación Naval Española (Spanish Naval Aviation) arm of the Spanish Navy was founded on 13 September 1917 and was active in a pioneering role with seaplanes and airships until the end of the Spanish Civil War, when the shortage of officers made the service nearly non-existent. 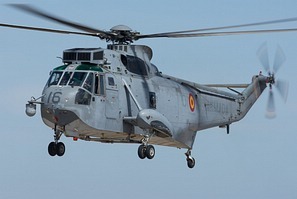 Tercera Escuadrilla (3rd Squadron) operates seven Agusta-Bell AB-212 ASW helicopters acquired in the late 1970s to perform air-to-surface warfare and anti-submarine missions. Later these helicopters were relegated to the transport mission and are currently in a process of life extension and modernization with updated mission systems that will allow them to also be effective in the maritime surveillance and security missions. Cuarta Escuadrilla (4th Squadron) nowadays has three modern Cessna Citation II jets and one Cessna Citation VII for its main mission of maritime surveillance, VIP transportation, and logistical support. Quinta Escuadrilla (5th Squadron) was established in the late 1960s providing the navy with high-performance Sea King anti-submarine warfare helicopters. Today the squadron is still equipped with the SH-3D Sea Kings helicopters converted to SH-3H standard and modified in 2002 to carry out its current main mission of tactical troop transport and Search and Rescue. Despite its age this helicopter is still very appreciated for its high performance and load capacity. Two of the Sea Kings are airborne early warning and control (AEW&C) variants. Sexta Escuadrilla (6th Squadron) flies the Hughes 500M /ASW (a specific version of the Hughes 369M for naval operations). The light helicopters were incorporated in the 1970s as anti-submarine helicopters and for SAR operations. With the introduction of SH-60 Seahawk helicopters, the main role became the training of the naval helicopter pilots. They can be also used as platform for Forward Air Control and perform reconnaissance and surveillance missions. 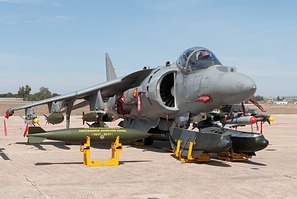 Novena Escuadrilla (9th Squadron) was formed in 1987 to receive the McDonnell Douglas AV-8B Harrier II V/STOL aircraft, later upgraded to the AV-8B+ standard. It is the only Esquadrilla operating fixed wing aircraft from the LHD Juan Carlos I (previously from the light aircraft carrier Principe de Asturias, decommissioned in 2013), making Spain one of the few countries with a battle group that has embarked fixed wing aircraft. Décima Escuadrilla (10th Squadron) was formed in 1988 receiving its first six SH-60B Seahawk helicopters in December that year. Thanks to the operational versatility of the SH-60B Seahawk, the Escuadrilla performs several types of missions, including surface and anti-submarine warfare, SAR, MEDEVAC, support and infiltration of Special Forces. Undécima Escuadrilla (11th Squadron) was created and organized in the first half of 2015 following the acquisition of ScanEagle UAV systems for surveillance and reconnaissance tasks. The unit is the only Escuadrilla equipped with UAVs. The ceremony held on 15 September at the Naval Base of Rota was attended by the King of Spain, Felipe VI, accompanied by the Minister of Defense and the Estado Mayor of the Armada (Spanish Navy). After the ceremony an air parade and a static exhibition were presented to roughly 700 guests at the base. The flypast consisted of formations with all the manned aircraft types in service with the Escuadrillas. The first formation of six AV-8B+ Harrier IIs (launched from the LHD Juan Carlos I), was followed by a formation of three Citations (a pair of Cessna Citation II and the Citation VII). The helicopters followed with an impressive formation composed of three SH-60B Seahawks, a pair of AB-212s, four SH-3D/H Sea Kings, and four Hughes 500Ms. The static display had aircraft from all the Spanish air arms and other government agencies. Obviously the FLOAN exhibited the most aircraft, showing one example of each aircraft type: H-500M, AV-8B+, SH-3D Sea King, SH-60B Seahawk, AB-212, and one of the new ScanEagle UAVs. On the big parking area, the guests also had the opportunity to see one Ejército del Aire (EdA - Spanish Air Force) EF-2000 Typhoon (from Ala 11, BA Morón) and one C-101 Aviojet of the acrobatic team Patrulla Àguila. 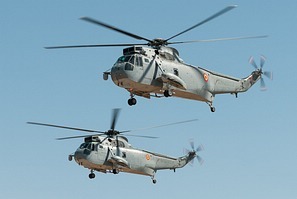 Besides the FLOAN, the Fuerzas Aeromóviles del Ejército de Tierra (FAMET - Spanish Army Aviation) presented three of its helicopters; the HT-17 Chinook, HD-21 Super Puma and HT-29 Caiman (designation for the NH90 TTH). The Guardia Civil sent one if its CN-235 maritime surveillance aircraft and the EC-135 and AS-365 helicopters, a BK117 was also present at Rota. A rare attendance of the AS-365 operated Agencia Estatal de Administración Tributaria (state tax agency) completed the Spanish line-up. 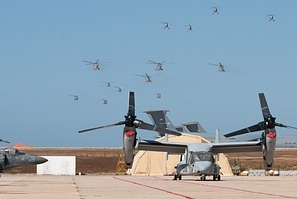 The U.S. armed forces, which have a major presence at Naval Station Rota, took part in the static display with a US Marine Corps MV-22B Osprey of VMM-261 'Moonlight' and a single AV-8B+ Harrier II belonging to VMA-223 'Bulldogs'. Both flew in from Morón de la Frontera (the Osprey is stationed at Morón Air Base, the Harrier was there on a temporary deployment). The next day over 20,000 people attended the air show held from 11.00 till 14.30 hrs at Playa de la Costilla de Rota, the final event of the centennial celebrations. The U.S. Navy joined and opened the aerial display program with a fly-past by a P-8A Poseidon, which had departed from NAS Sigonella, located on the island of Sicily, southern Italy. A couple of flypasts were made by a P-3B Orion of 221 Escuadrón of the Ejército del Aire. The crews of these maritime patrol aircraft include Navy personnel. The Harriers and the Sea Kings in the demonstration took off from the amphibious assault ship LHD Juan Carlos I located off the beach front, while the rest of the FLOAN's helicopters (three SH-60Bs, two AB-212s, and three H-500Ms) took off from the Air base for the display. Two Harriers presented a nice air power demonstration, showing also their hovering capabilities. The Sea Kings and the AB-212s performed a SAR demonstration. The FAMET participated in the air display with all the helicopters present: HT-17 Chinook, HD-21 Super Puma and the HT-29 Caiman (NH90 TTH). The Caiman made its debut in a public event. The Guardia Civil presented a flypast and display with its CN-235, EC-135 and AS-365, while the Agencia Tributaria gave a very nice demo with its AS-365. The Ejército del Aire provided an impressive display performed by the EF-2000 Typhoon from Ala 11 and the Patrulla Águila aerobatic team closed the program with their 35 minutes display.